If you’ve been in the business of marketing for more than 5 minutes you know, or at least you’re aware of, the potential value content can offer a company or organization. But getting budget to launch a content marketing initiative has to be approved and step #1 is getting buy-in from management. Content Marketing Institute (CMI) recently launched a campaign around obtaining buy-in from the decision makers within an organization. 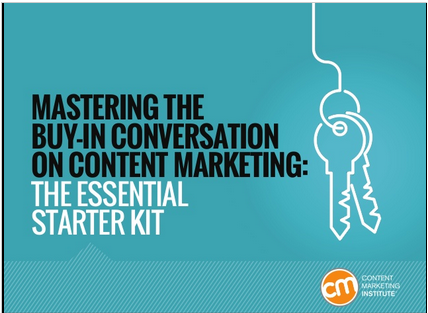 And they’ve armed us marketers with a bunch of knowledge and statistics in their latest eBook/Slideshare ‘Mastering the Buy-In Conversation On Content Marketing: The Essential Starter Kit’. Jodi Harris, CMI’s Director of Editorial Content and Curation does a nice job in her latest article ‘How to Win Your Battle for Content Marketing Buy-in’ in an effort to aid marketers with their task. Plus her piece includes over 50 stats that you can use to help win your boss or client over; and it’s our featured article on today’s episode of your ‘A Slice A Day’.